It's never been easier to produce that beautiful color that big masses of hydrangea flowers do best. For the best blue blooms, macrophylla and serrata hydrangeas require acidic soil. 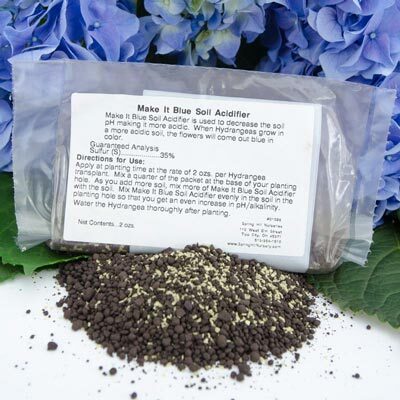 If your soil is naturally more alkaline, a simple application of Make it Blue Acidifier will fix that. Each premixed 2 oz. package is specially formulated to give these shrubs what they need to flower in blue. Simply mix it into the soil, according to the instructions provided on the packaging. You can prepare a newly planted macrophylla or serrata hydrangea, or you can transform an already established one. Reapply each spring to keep the color coming back blue.